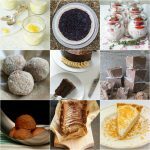 One of the benefits of developing new recipes for this blog is that it shakes me out of my food ruts. I tend to just broil or sauté cauliflower, and if I make cauli-rice, it's usually plain as a base for something more interesting, like curry. There's nothing wrong with that, but it can get a little boring. No longer! I figured your standards might be a little bit higher, so I spent the past two months trying out different flavor combinations. These are the ones that made the cut. 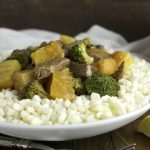 Side note: there's a theory that bacon makes everything taste better; cauliflower rice is the exception! I know – it shocked me, too. Is full of vitamins, providing 73% of your daily vitamin C, along with 15 other nutrients, including many B vitamins. Is full of antioxidants, including beta-carotene, beta-cryptoxanthin, caffeic acid, cinnamic acid, ferulic acid, quercetin, rutin, and kaempferol. 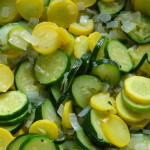 Is a sulfur-rich vegetable, and Dr. Terry Wahls suggests we eat 3 cups of these daily. Why? They support our bodies' ability to detoxify. This is especially important for people with autoimmune disease, because most of us have compromised detoxification abilities. Is anti-inflammatory, containing glucobrassicin, which works on a genetic level to turn off inflammatory responses. Has beneficial fiber that feeds the good bacteria in our guts, while also working to suppress overgrowth of h.pylori. Today, I'm sharing 4 very different flavors of this recipe. Feel free to experiment on your own to create even more. 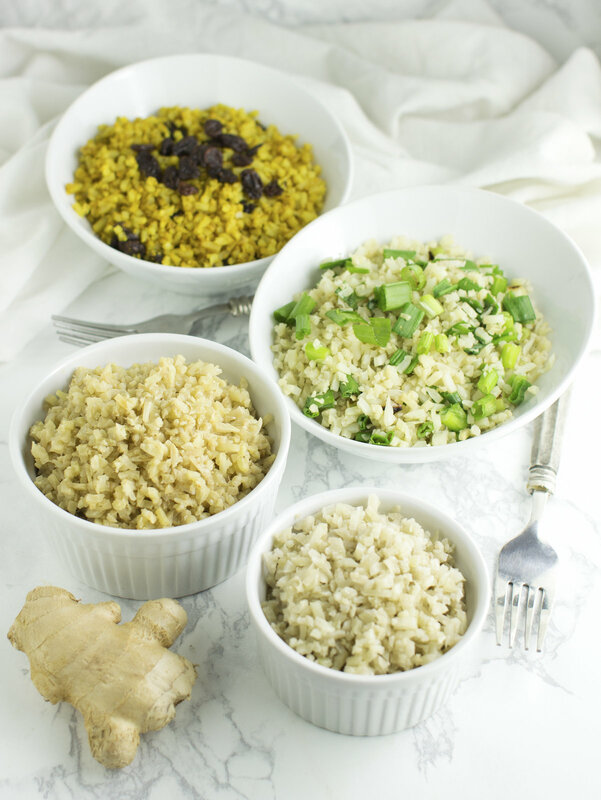 Plain cauliflower “rice” is a great base for curries, stir fries and any meals with a sauce. Scallion “rice” incorporates another powerful vegetable into the meal. Did you know that scallions contain 120 times more antioxidants than regular onions? The secret is in the greens – you need to eat the whole scallion. Asian ginger uses fresh ginger along with some paleo staples (red boat fish sauce and coconut aminos) to provide a flavor punch. Moroccan spice might just be my favorite variation. 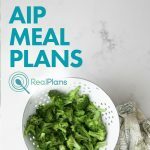 These AIP spices blend together beautifully, and there's even a hint of “butter” flavor in the mix. I don't know where that came from, but I'm excited. As someone who is dairy-intolerant, I haven't tasted anything like that in a long time. 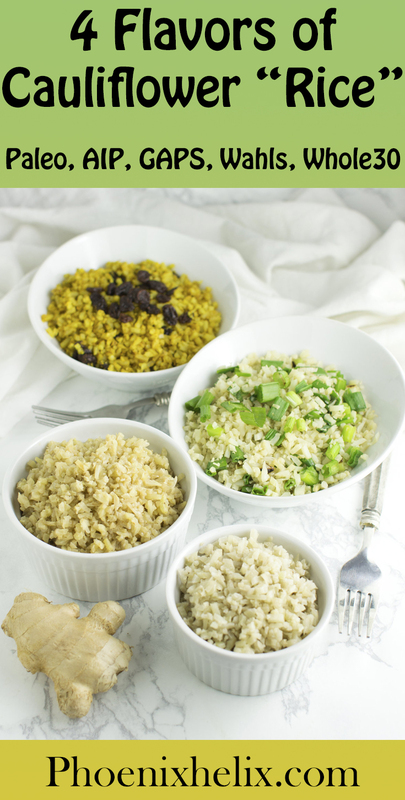 If you've never made cauli-rice before, you're in for a treat! Do some experiments with your first few batches to find the texture you like best. 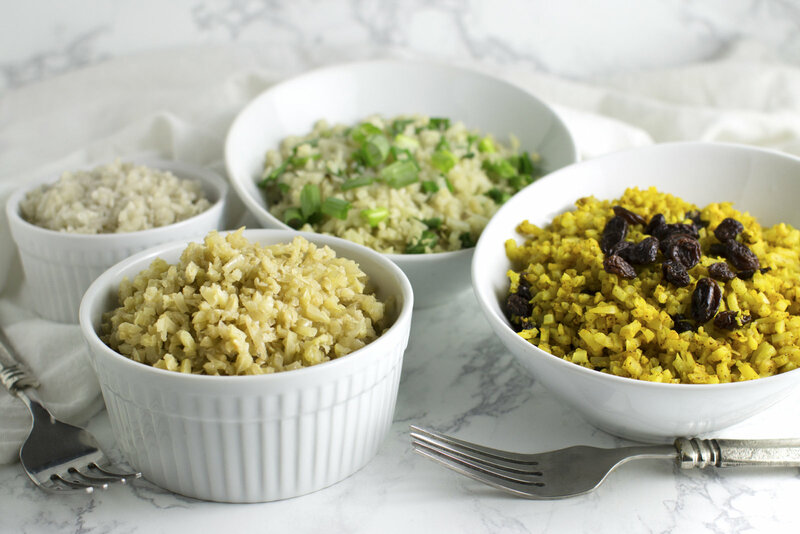 There are two places you can vary the recipe slightly for texture: (1) When you pulse the cauliflower in the food processor, you get to decide how small you want your “rice”. I like mine to be a little varied in size, so I don't pulse it quite as finely. If you look closely at the picture above, you'll see what I mean. Other people like it to be a more fine and uniform texture. Just don't turn it into mush. (2) When you cook it, you can either leave the skillet uncovered for an “al dente” texture, or covered for a softer texture. Try both ways and see what you prefer. I actually like both! Directions: Cut cauliflower into florets and pulse in food processor, until it reaches rice consistency. Set aside. If you don’t have a food processor, you can use a hand grater. Melt fat in large skillet over medium heat. Add cauliflower rice and sprinkle with sea salt. Cook 3 minutes. Use spatula to turn over, sprinkle with more sea salt, and cook another 3 minutes. Directions: Cut cauliflower into florets and pulse in food processor, until it reaches rice consistency. Set aside. Heat oil in large skillet over medium heat. Add the white slices of scallion and sauté 2 minutes. Add the cauliflower rice and toss to blend. Sprinkle with sea salt and cook 3 minutes. Use spatula to turn over, sprinkle with more sea salt, and cook another 3 minutes. Add the green slices of scallion, toss to blend and serve. Directions: Cut cauliflower into florets and pulse in food processor, until it reaches rice consistency. Set aside. Melt oil in large skillet over medium heat. In a small bowl, stir the fresh grated ginger, fish sauce and coconut aminos together. Add to the coconut oil in the skillet and stir to blend. Add the cauliflower rice and toss until evenly coated in flavoring. Cook 3 minutes. Use spatula to turn over and cook another 3 minutes. No salt needed, because fish sauce is salty (but ironically doesn't taste like fish). Directions: Cut cauliflower into florets and pulse in food processor, until it reaches rice consistency. Set aside. Melt coconut oil in large skillet over medium heat. Add spices and stir until blended with the oil. Add cauliflower rice and toss until evenly coated in flavoring. Sprinkle raisins on top. Cook 3 minutes. Use spatula to turn over and cook another 3 minutes.